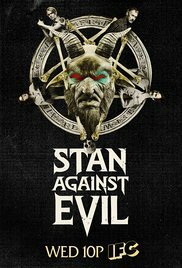 IFC’s original horror comedy, Stan Against Evil, showed up at SDCC with stars and creatives in tow, to talk about season two of their quirky show. A grouchy man reluctantly teams up with the town’s sheriff to deal with pesky demons invading their quiet hamlet. We hate when that happens! Stars John C. McGinley (Stanley Miller), Janet Varney (Evie Barret), and Dana Gould (Kevin/Series Creator) sat down to share their feelings on how to make horror and comedy mesh, and their goals for season two! Check out our interviews below and don’t forget to catch the second season of Stan Against Evil on Wednesday, November 1st on IFC.